Operators are constantly looking for ways to drill more efficiently and safely while lowering their overall well costs. Identifying gaps in performance and Invisible Lost Time (ILT) can be challenging. And understanding the reasons behind these gaps and inconsistencies so you can improve is almost impossible without the right set of tools. 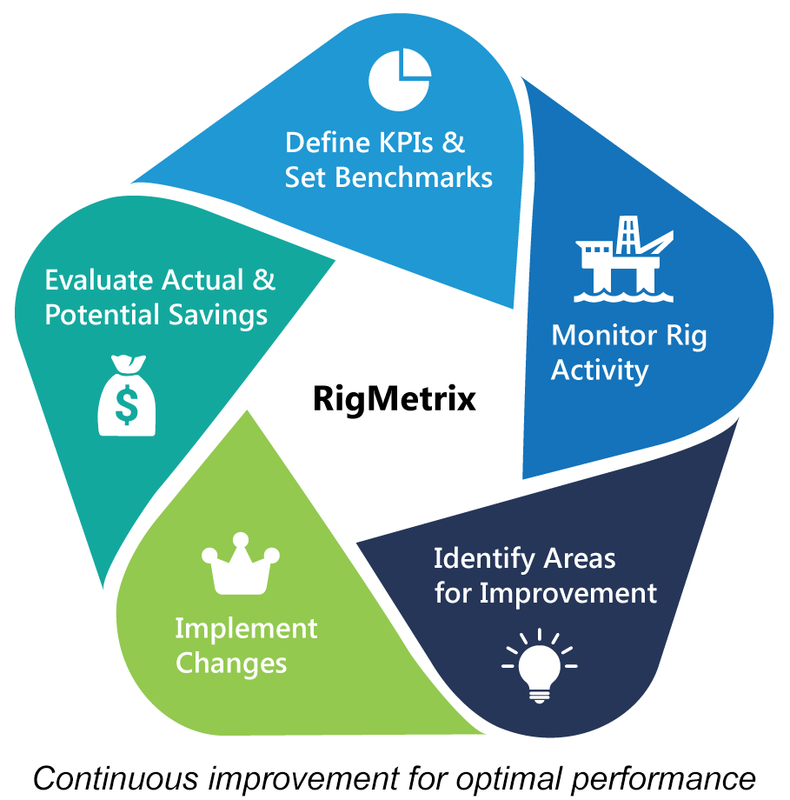 RigMetrix™ is a drilling and performance analytics solution that uses rig sensor data to automatically generate detailed rig state descriptions of activities. It uses intelligent processes that allow the user to analyze the rig operation with a high level of detail and accuracy. It identifies performance gaps and ILT, and provides reporting that highlights inconsistencies while enabling the analysis needed to address them. The result? Reduced drilling time and lower costs. Automated Rig State Detection – this automated process identifies the rig state in real-time and corrects it in near real-time based on an understanding of the drilling operations. It uses machine learning concepts for a more accurate view of your rig performance. The process identifies thousands of operations in real-time to provide more than 25 major rig activities. KPI Report – this report features over 150 KPIs and capitalizes on the intelligent rig state calculation to provide real-time event-based KPIs. It also provides statistical analysis of those KPIs. And because the rig state accuracy is highly important, it measures and reports rig state quality KPIs as well. KPI Comparison – a unique interactive tool that lets you take an even deeper look at your operation. You can compare the performance of multiple rigs, crews, fields or wells in one chart so you can perform in-depth analysis using multiple layers of filtering (e.g. hole size, BHA, crew time, formation type and more). It identifies performance gaps and captures best practices without having to go to multiple reports. Rig Ranking – also unique to the industry, this evaluation tool tracks rig efficiency changes based on pre-defined criteria and targets using a performance and well delivery index. It ranks the fleets based on actual performance so you can quickly see which rig is performing better than the other and link that to the cost plan. Rig Overview Gantt Chart – provides a quick overview of active rigs and wells for each field within a certain time range. Real-Time KPI Dashboard – provides real-time KPI calculation whenever an operation event takes place, instantly showing the driller the performance, step-by-step, without waiting 24 hours to receive the daily report. Progress Chart – allows for real-time tracking of well progress (days vs depth). Target Setting – used by administrators to easily set up multiple targets for each KPI based on field, rig or crew specifications. Client System Interface – RigMetrix allows integration with client information from the daily drilling report and BHA to help compare manual reporting against sensor information. It also enables RigMetrix to report on static KPIs not related to sensor data like BOP, Non-Productive Time (NPT) and cement. Operations Reports Comparison Between Manual DDR and Automated Rig State. Savings Report – this translates the operations’ performance into dollar values to show the actual money saved. It also shows the remaining potential savings based on realistic analysis of interactive performance targets. Daily Drilling Report – an automated time log report that uses the sensor data/rig state to provide accurate operation time log for daily operation. It’s used to improve the conventional manual IADC – International Association of Drilling Contractors’ reporting system. End of Well Report – a KPI performance report generated at the end of each hole section/well to provide overall performance analytics.